Stuffing is a Thanksgiving staple, but that doesn’t mean it has to be restricted to just inside the bird. 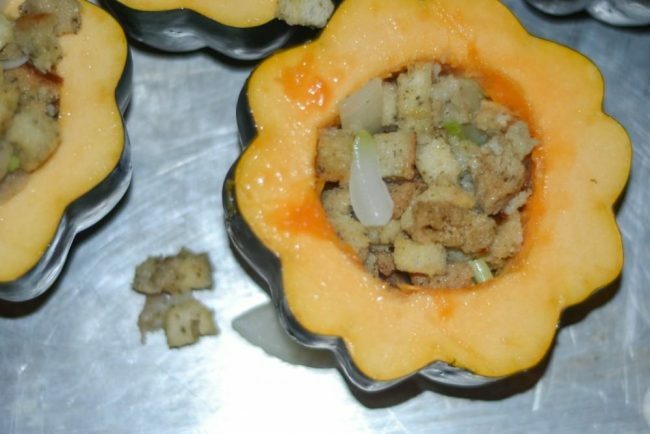 This year, try something different and bake stuffing inside an acorn squash! It will look really unique and festive on your table setting and will be a hit with your guests. This recipe was inspired by the acorn squash stuffing recipes on Pinterest, like this pin, but I’ve made it my own. Split acorns in half. Remove pulp and seeds. Place acorns on a baking sheet. Coat with small amount of olive oil. Bake in oven for 20 minutes. While acorns are in the oven, melt butter in a pan. Dice onions and celery. Add veggies to the butter over a medium heat. Saute onion and celery, do not let them brown. Add chicken broth. Continue cooking on medium heat until comes to a boil. Remove from heat and stir in stuffing until well coated. Scoop mix into each squash. Festive and unique Thanksgiving side dish recipe! Pop over to see our other Thanksgiving recipes including a roasted turkey recipe and yummy rosemary and garlic mashed potatoes! Would you serve this unique acorn squash stuffing recipe at Thanksgiving? 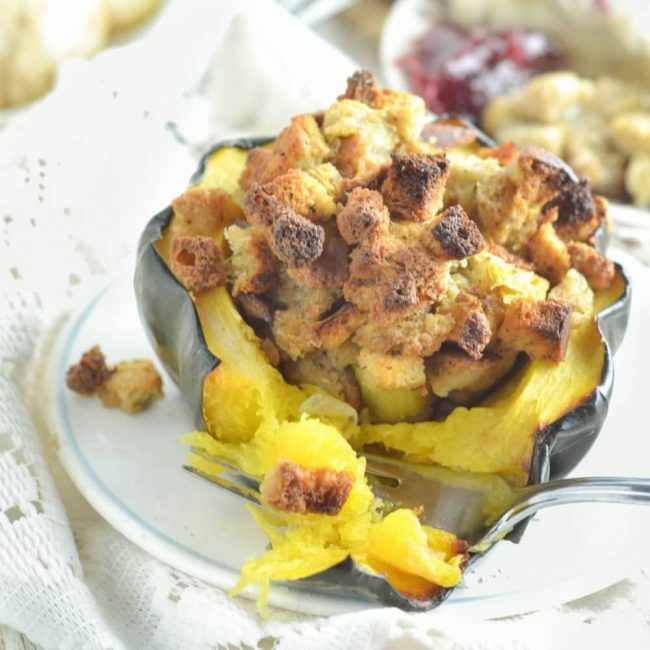 Acorn squash and stuffing are seriously two of the best foods on this earth, and I love that you have combined them so beautifully! I would love to be eating this right now. I’ve never made anything with acorn squash before but I should. This looks really AWESOME! omggg. this looks amazing. wowsers! i am gonna pass this along to a few of my friends and my mom they would totally love it. Loving the presentation. I bet it tastes delicious too. Acorn squash is so delicious. 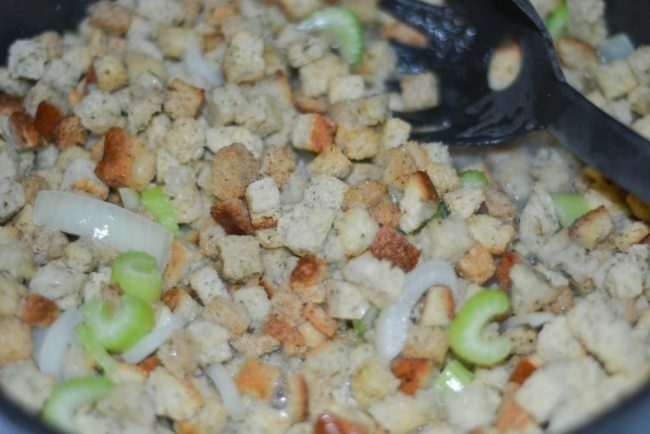 What a great idea to use these for single servings of stuffing, your recipe looks really good, I can’t wait to try it. It looks so festive and it’s so perfectly portioned. I’ll have to try it. I love acorn squash! Never thought to use it with stuffing though – yum! What an interesting way to make stuffing. My brother loves squash, I’m sure this is something he’d enjoy. 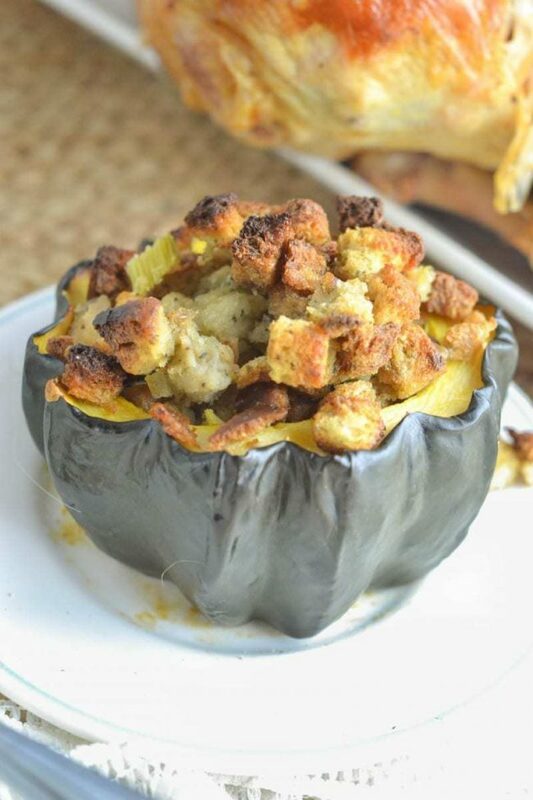 What a neat idea to make acorn squash stuffing, I honestly never thought of it. It looks really scrumptious! This looks tasty. I would totally make this. Don’t know if anyone else in my family would eat it, but I sure would. This looks like a yummy side dish for all of fall and winter. Thanks for the delish recipe! I love this recipe idea! 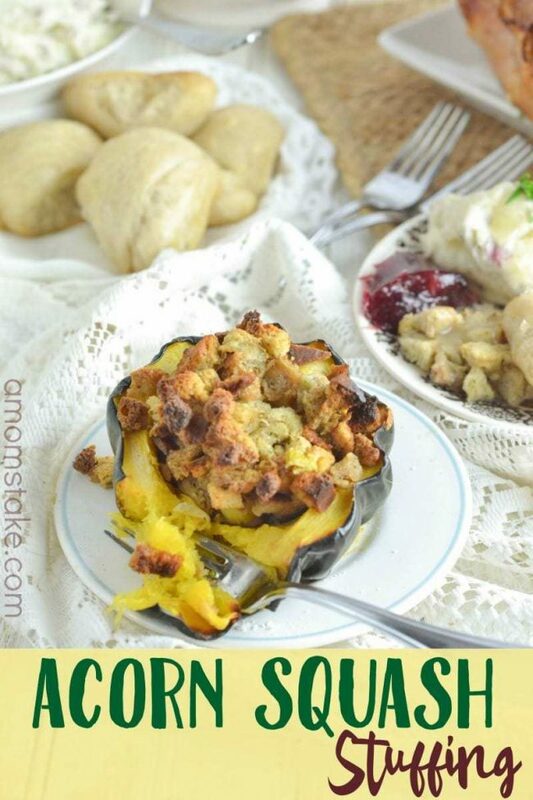 Making stuffed acorn squash would be pretty darn awesome! I have actually never had acorn squash before, but it looks really yummy! I’ve always wanted to experiment with acorn squash. I love that you can pretty much stuff them with anything. Yours looks very delicious! That looks really good! I love acorn squash!